2011 – What’s in store? 2011 is upon us and the new school year begins in just over a week. I’ve enjoyed a good holiday and am beginning to think about school and teaching again. This year brings the revised NCEA Level 1 Achievement Standards. This requires new learning for teachers and students. As a result it brings with it a whole lot of new teaching and learning resources in my school which I (and my colleagues) will need to become familiar with. 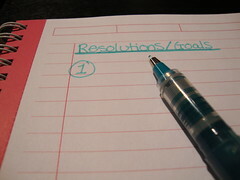 With a new year for many people come resolutions and goals. One of my goals this year is to help develop online teaching and learning materials for distance learners at NCEA Level 1 in particular. This is easier said than done. Most of the e-learning papers/articles that have been written are for higher education. This is an area that has been working in one way or another in online learning for a while. Some of it has been quite effective, and others have not. Of course the advantage in higher education is that the teachers/facilitators can assume that their students are able to read and write and that their students will cope with a lot of text. This is not necessarily the case for secondary students. Some secondary students can barely read. They require a lot of motivation to read text in order to learn, therefore images/diagrams/videos are very important. One could argue they are important at higher levels also, however there is a different motivation for students who are choosing to study rather than those who have to study due to legal requirement. So, to develop online teaching and learning materials for distance secondary students will be (and has been) a challenge. They need to be interesting, motivating and demonstrate good pedagogy. I am continuing with my post-graduate study in e-learning, so hopefully this will help. I found the study interesting and motivating last year and am looking forward to that beginning again near the end of February. Of course it means I’m giving myself extra to do along with raising a family of 5 kids, but I think it’s worth it! One thing I’m interested in this year is what new technology is to come. With the iPad last year has meant that a lot of companies have been developing their own similar tablets. I wonder what the introduction of a greater range of tablets (some very cheap) can offer education. Well, let’s wait and see and enjoy the year!